The Buck Trail Timber has the best from both worlds. Made of 100% carbon and a classy wooden finish. A great arrow for all traditional archery enthousiasts. An obvious choice... Hard to resist. 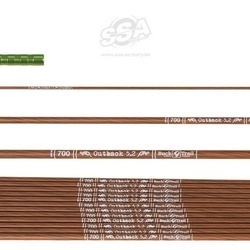 - Full carbon shaft with straightness tolerance of ± .005"
Se gaseste in variante cu spineul de:700, 600, 500, 400, 350, 300.